What is the Best Dog Food For Bullmastiffs? This dog breed has a reputation for being a fearless guardian. 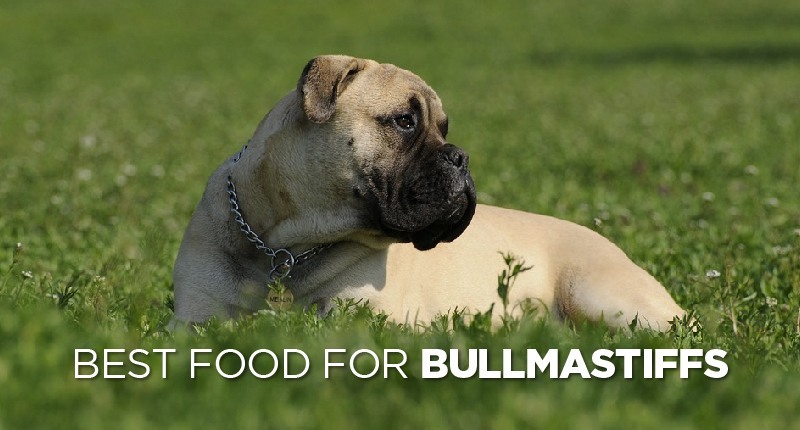 But what’s the best dog food Bullmastiffs? What do you feed a dog that’s both a fierce protector and a loving, mellow companion at the same time? Luckily, we’ve done the research—and here’s the verdict. This dog breed grows to a height of about 2 feet, 3 inches tall at the shoulder, and can weigh anywhere from 100 to 130 pounds as full-grown adults. Bullmastiffs are powerfully built and formidable in appearance—but they’re also loving family dogs and amazing companions. A less active Bullmastiff will require close to 1,700 calories per day to stay fueled and energized—while a more moderately-active dog of this breed will require closer to 2,100 calories per day. If your Bullmastiff is highly active, then be prepared to feed him/her as many as 3,400 calories per day—or even more, depending on the individual size and weight of the animal. Just remember that every dog is going to be a bit different—and that some animals might require a few more calories than others. Always try to pay attention to how much your dog is eating, and feel free to adjust caloric intake as needed—just to make sure that he/she is getting enough to eat. Want to Learn More About Bullmastiffs? This video, from the very popular Dogs 101 series (created by Animal Planet), does an awesome job of explaining the surprisingly docile and friendly temperament of these monster-sized canines! If you’re a Bullmastiff fan, then you should probably take a few minutes to check it out. Bullmastiffs require healthy amounts of lean protein—to keep them lean and muscular. They also benefit from a gluten-free diet, as it helps to promote better digestion and keeps them from suffering from conditions like bloat. Omega 3 fatty acids are pretty important to this dog breed, for a number of different reasons. They need them for a shiny, healthy coat, and also for their predisposition toward conditions like hip and elbow dysplasia. Fruits, vegetables, and vitamins are super-important to a dog of this size. Vitamin C is a must for the healthy Bullmastiff, as is a range of minerals like Zinc, Calcium, and Copper. Bullmastiffs can also be prone to gassiness—so it might take a bit of trial-and-error to find a dog food that minimizes this problem (if that’s even possible—all pets are a bit different in this regard). Bullmastiffs are typically pretty healthy—but they can still be prone to a few different health problems. Buying your dog from a reputable breeder where they check both parents for genetic diseases would be the best way to avoid most problems—but just in case your dog ends up being unlucky enough to develop something, here’s a list of some of the more common ailments that Bullmastiffs can be prone to. Not all Bullmastiffs will suffer from these—but it’s still a good idea to know what to look for, just in case! This is a condition in which the thigh bone doesn’t quite settle into the hip joint as snugly as it should. This can cause pain and/or lameness in one or both of the dog’s rear legs. It can also lead to arthritis later on. According to an article published on whole-dog-journal.com, you can help to prevent and/or aid this condition by feeding a diet of high quality protein, carbs, and fats. It’s also recommended that you make sure that your dog is getting adequate amounts of Vitamins C and E.
You can find out more about this unfortunately-common joint problem here. This condition is, unfortunately, common to larger dogs. It basically affects the joints in one or both of the front legs, and is believed to happen when the bones that make up the elbow don’t grow at the same speed. A diet rich in glucosamine might help to prevent or lessen the impact of this condition. It’s also recommended that you feed your dog a grain-free, all-natural diet to help avoid the possibility of arthritis later on. Surgery is usually required to help the dog recover completely. This disease is caused by a deficiency of thyroid hormones. Some of the symptoms of hypothyroidism include obesity, mental dullness, infertility, and a lack of energy. A wide range of tests, which can be administrated by your vet, are often needed to get a firm diagnosis—but the good news is that this condition is definitely treatable. You can also help your dog by providing immune-support in the form of plant sterols—which can be obtained by feeding a diet that’s rich in vegetables, fruits, and seeds. Feeding a diet that’s rich in Vitamin E is also extremely beneficial. Weeks 3 to 7 are crucial for this dog breed, because this is the time during which their mothers teach them vital social skills. They also learn how to act around other dogs from their littermates. If a Bullmastiff is taken away from their mother and litter too soon, it can cut this crucial period short and produce a puppy that’ll be difficult to train and manage. As a general rule, a puppy of this breed should never be separated from the litter before he or she is at least 8 weeks old. Bullmastiff puppies will tend to weigh about 15 pounds or so by the time they’re 9 weeks old—and will need about 460 calories per day to stayed properly nourished. Of course, different puppies will have different weights—so make sure to factor this in when doling out kibble—even at a younger age. So, What’s the Best Dog Food for Bullmastiffs? There are definitely more than a few high-quality dog foods on the market right now that you could feed your Bullmastiff to keep him/her healthy and vital, but we’ve decided that Hill’s Ideal Balance Grain Free Natural Chicken & Potato Recipe takes the cake for being one of the very best choices on the market. First of all, it’s grain free—which is good for overall nutrition and for the breed’s predisposition for elbow dysplasia. It also provides adequate amounts of Vitamin C and Vitamin E—both of which are essential if your dog is genetically linked to Hip Dysplasia. These vitamins might not necessarily prevent the condition altogether—but they can help to delay it, and have also been shown to help the dog deal with the pain—which are both very good reasons to make sure that your dog gets enough of both! This formulation also contains a ton of fruits and vegetables—both of which are essential for preventing and managing hypothyroidism (which is unfortunately common in this dog breed). Add to all of this the fact that Hill’s Balance contains healthy amounts of Omega 3s, Omega 6s, and lean protein, and you come up with everything needed to give your Bullmastiff a diet that’ll keep him/her strong and capable. It’s also filled with antioxidants—which is a huge plus and a necessity for any dog breed. If you’re looking for a nutritious dog food formulation that does pretty much everything right, then you’re definitely going to want to check out Hill’s Ideal Balance Grain Free Natural Chicken & Potato Recipe for the special Bullmastiff in your life.